Cream's on at the Katzen and there's a talk by the curators tonight, Thursday, February 25, 2010, 6:30-9:30pm at the Katzen Arts Center, 4400 Massachusetts Ave. NW, WDC. Check out the selected artwork here. Nothing can help curling, but I've got this great idea for the Olympic committee to make the luge event more exciting: rebuild the courses to be wider so that all of those little cars can come down at once and thus they're really racing against each other instead of individually against the clock. Then it would be like NASCAR on ice and the event would get huge ratings from NASCARites. Ideas to help curling be more exciting welcomed. DC: Who or what has been your biggest influence as an artist? Artomatic was my gateway to the artistic work I do now. At my first Artomatic I was overwhelmed by the vastness of the work. Some works fired me with inspiration, others I found mediocre. But ultimately, it was the mediocre works that gave me belief that: “hey, I could do that”. DC: What are some of the challenges or mistakes that you have experienced as an artist and what did you learn from it? 1. Not being able to delegate. 2. Not colleting email addresses from the first day of the Blog. 3. Having a bad interview with one of the producers of Oprah. DC: What key event, or person, if any, has attributed the most to your success or progress as an artist so far? My literary agent, Brian DeFiore helped me create the kind of PostSecret book series I had imagined. Theo Moll, helps me set up speaking events at schools, performing arts centers, and museums. I am enjoying that part of the project -- sharing the stories and listening to secrets -- more than anything else now. DC: What advise would you give to emerging artists? Create art that one of your parents likes but the other hates. DC: Who is your favorite DC area artist? I have work hanging in my home from my favorite artists. Most of them I met through Artomatic. Mark Jenkins, John Adams, Scott Brooks and Tim Tate. DC: Anything coming up in the near future for you? I have been working on short PostSecret films here are two I’m proud of: click here. 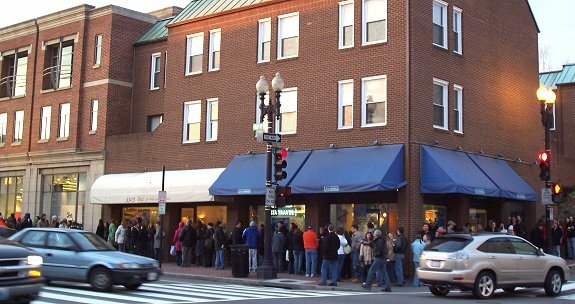 Above are the hour-long lines to get into one of Warren's shows in Georgetown a few years ago. And everywhere that he takes his PostSecret show to, the lines are just as long.